On May 6, 2010, Sadguru Shree Aniruddha guided his Shraddhavan friends on ways to establish the ‘Ramrajya’ (Kingdom of Ram) in the society as also in their lives, in his discourse on the Ramrajya. Sadguru Shree Aniruddha had declared a few projects that would allow establishing Ramrajya on a personal, domestic and social level. Furthermore, he advised to personally perform certain upasanas as also following certain other religious practices which included the Prapatti for both men as well as women. “The Ranachandika Prapatti is observed on Mondays in the month of Shravan (in Hindu calendar). “Shraddhavans may observe the prapatti on any Monday in the month of Shravan. It is better if observed on two Mondays in the month and even better if observed on all of the Mondays in the month”, said Bapu while elucidating on the prapatti. The capacities of women and men both differ considerably, a distinction created by nature itself. Hence, for women, the prapatti has been presented only on one day of Makarsankranti, whereas for men, on the Mondays of the Shravan month. 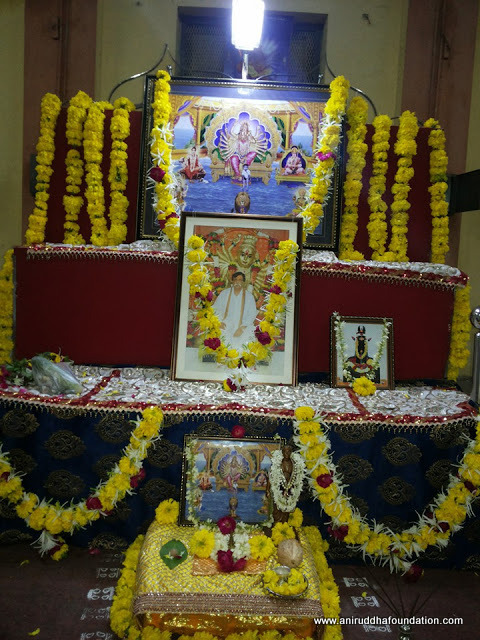 Subsequently, Bapu made changes to the Ranachandika Prapatti for men given the changing times, and it is now the ‘Shree Mahadurgeshwar Prapatti’. The Mondays in the month of Shravan are addressed to the reverence of the Shivashankar as well as God Nrisimha. In his discourse on the Ramrajya, Bapu had said, every man must hold firm belief that the Trivikram himself is Nrisimha. The image of the Trivikram is worshipped during the Mahadurgeshwar Prapatti. Also, in the arrangement for the prapatti, the photo frame of Shree Chandikakul is placed behind the Trivikram’s image. In the picture of Shree Chandikakul, the Shivlinga appearing throned before Shree Hanumanta is his Atmalinga (the Soul of Shiva) which is nothing but the Mahadurgeshwar himself. Shree Mahadurgeshwar is thus visible in the Shree Chandikakul photo frame. The image is thereby, placed in the arrangement for the Mahadurgeshwar Prapatti. As far as possible, the prapatti may be performed collectively. Albeit, one may also offer it individually if he is unable to do so otherwise. How should one perform the Shree Mahadurgeshwar Prapatti? The male Shraddhavans may gather and offer the prapatti after the sunset. The prapatti is performed in the Shraddhavan dress code (viz., a white shirt, a Lungi and Uparna). The prapatti is initiated by chanting the Gurukshetram mantra five times, followed by the chanting of the Shree Mahadurgeshwar mantra 11 times. After that, a wonderful story full of Bhakti on the Shree Mahadurgeshwar Prapatti is read out aloud. The tale recounts the significance of offering the Prapatti on Mondays in the month of Shravan and the changes it brings about thereafter. The story provides us with strengths of all kinds. 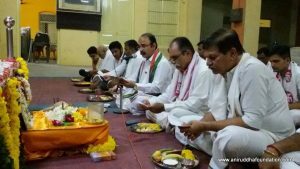 Later, the Dwadash Jyotirlinga aarti is recited, and Shraddhavans perform the aarti by moving the small poojan platter which is filled with the requisite poojan items around the arrangement and before the photo for the prapatti, in circles as done traditionally. After that, the Shraddhavans chant the ‘Bam Bam Bholenath, Bam Bam Bhole’ Gajar 12 times while they circumambulate around the prapatti arrangement. In the gajar, the Bam beej represents development, strength, as also grace. Moreover, the Balagangagauri or Mata Shivagangagauri, who rids one from all kinds of misfortune, is the ruling authority. The Trivikram is then offered yellow and white coloured flowers after which, he is offered the akshata (rice grains turned red with kumkum) and paid obeisance.